LIMA, Dec 10 2014 (IPS) - The post-2015 global climate change agreement should be flexible and fully resourced or else condemn Africa to another cycle of poverty resulting from the adverse effects of climate change. Echoing this view, African delegates and civil society groups at the ongoing (Dec. 1-12) U.N. Climate Change Conference in Lima, Peru, said that some of the continent’s demands were being relegated, yet they are crucial for the post-2015 period. Azeb Girma, an environmental activist from Ethiopia, told IPS that he was disappointed with the way the negotiations were proceeding. “We thought to have a pathway to Paris [venue for the next climate change conference in 2015] but Africa is cheated. Africa is demanding adaptation but this has been pushed away. The discussions are leading nowhere,” said Girma. Some of the negotiators claimed that developed countries were backtracking on some of the positions earlier agreed to at the Durban Climate Change Conference in 2011. 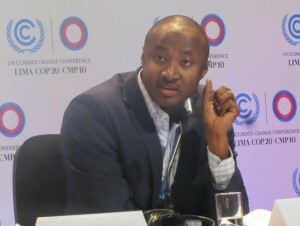 Dr Tom Okurut, Executive Director of Uganda’s National Environment Management Authority (NEMA), told IPS that in Durban parties had agreed that adaptation was supposed to be part of the post-2015 climate deal but some developed countries were not willing to commit themselves in the draft texts. “We need a legally binding agreement that binds all parties to whatever has been agreed to, unlike the current protocol where parties can opt out of the process. Right now, everything is voluntary and that is why we are not getting very big output here,” said Okurut. Since the beginning of the Lima conference, the African Group has been pushing for a multilateral rules-based system with a comprehensive outcome aimed at halting the growing threat of climate change to the African continent. “We have a mandate from science, from our people, from the continent of Africa, and from the United Nations itself to push for enhanced global climate action to cut [greenhouse gas] GHG emissions as well as strengthen adaptation; this remains a priority for us,” said Nagmeldin El Hassan, Chair of the African Group while addressing a group of African journalist covering the conference. Among the more thorny debates in this round of talks is the scope and format of country pledges or ‘Intended Nationally Determined Contributions’ (INDCS). Some parties, especially the African Group and most of the least developed countries (LDCs), want the focus to be on both mitigation and adaptation, while those in developed countries want the focus only on mitigation. 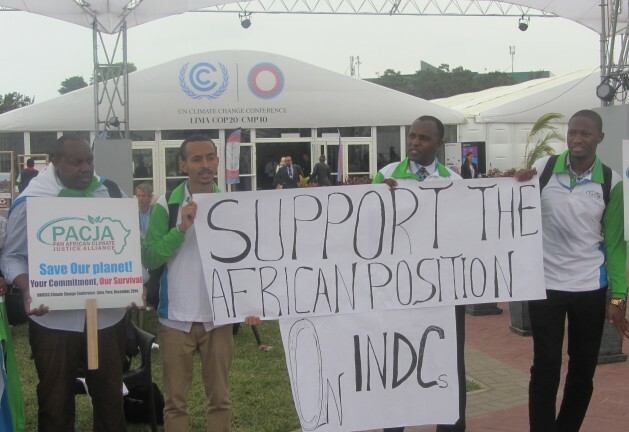 Earlier in the week, several African environmental groups under their umbrella group, the Pan African Climate Justice Alliance (PACJA), held a demonstration at the convention centre urging ministers and other negotiators to back the African position on INDCS. “We call on all parties to take seriously their responsibility to agree on deep emission cuts and avoid further climate crisis. Time is running out while the negotiations are moving at a very slow pace,” said Nicholas Ndhola, an activist from Zimbabwe. “We urge and demand all parties, especially the developed countries, to agree on the scope of INDCs to include all elements and not only mitigation which tends to ignore differentiated commitments towards finance, adaptation, technology transfer, means of implementation and capacity-building,”he added. John Bideri from Rwanda told IPS that the developed countries were seemingly determined to ensure that issues about adaptation and technology transfer are not adequately agreed and defined as the parties agree on framework for the next agreement to be hammered out in Paris in 2015. “It is time to come up with an equitable deal. Lima may be the last chance for us to make a breakthrough and end a standoff that has prevented adequate climate action for decades. Please stand with the poor, stand with the vulnerable,” urged Bideri. The INDCs bring together elements of a bottom-up system – to be put forward by all countries in their contributions in the context of their national priorities, circumstances and capabilities – with the aim of reducing global emissions enough to limit average global temperature rise to 2 degrees Celsius. According to the London-based CARE International, there is a need to set clear guidelines on the scope and format of INDCs. “At the moment we run the risk of having to compare apples with oranges – if we don’t clearly define what countries must include in their national climate commitments towards the new agreement due in Paris next year, then it will be extremely difficult to understand how much progress is being made to curb climate change,” said Sven Harmeling, CARE International’s climate change advocacy coordinator. While Africa has been pushing for adaptation as part of the post-2015 agreement, it is not about to give up the demand for mitigation in areas of sustainable land and forest management, especially carbon finance, under the Reducing Emissions from Deforestation and Forest Degradation (REDD+) programme. Dr Ephraim Kamuntu, Uganda’s Water and Environment Minister, speaking at a REDD+ post 2015 discussion organised by the Peruvian government, said that parties to the U.N. Framework Convention on Climate Change (UNFCCC) have been slow in implementing the Warsaw REDD+ Framework. “We would want our colleagues in developed countries to agree on REDD+ result-based financing. This is a very key issue for us in Africa. We affirm the need to integrate the REDD+ into the overall structure of the 2015 agreement for durable and effective climate change governance,” said Kamuntu. Critical among Africa’s demands is fulfilment of the financial pledges for climate financing. At the Copenhagen Climate Summit in 2009, developed countries pledged to scale up climate funding to 100 billion dollars a year from private and public sources by 2020. For the African Group, fulfilling this could make money available for a post-2015 poverty eradication agenda. Some developed countries, such as Norway and Australia among others, have announced contributions to the Green Climate Fund, bringing the fund to close the 10 billion dollar mark. Seyni Nafo, African Group spokesperson and a member of the UNFCCC Standing Committee on Finance, told IPS that much more funding was needed. “Recent pledges to the Green Climate Fund are a small first step, but funding around 2.4 billion dollars per year is not close to the actual need, and is a far cry from the 100 billion dollars pledged for 2020. Lima should provide a clear roadmap for how finance contributions will increase step-by-step up to 2020,” he said. The European Union has agreed to reduce greenhouse gas emissions by 40 percent by 2030. The United States and China have announced commitments to reduce greenhouse gas emissions in a bilateral agreement, sending a strong signal for implementation of an international climate treaty in 2015. Seyni Nafo said the recent announcements by the European Union, United States and China of their 2030 emission targets were to be commended for proactivity but fall well short of what science requires. He challenged the European Union and the United States to match stronger mitigation targets with intended contributions on finance, adaptation, technology transfer and capacity-building in accordance with their obligations under international law.